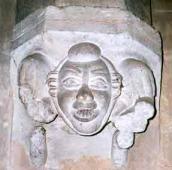 Grotesque human figures placed horizontally as corbels on the arch leading into the chantry represent medieval jesters. Below the corbel is the remains of a wall painting. There is a foliage scroll along the top, and a black background against which a painting of a crowned lady, in fashionable dress with a bodice, is shown kneeling. A previous conservator believes that the unpainted strip at the western edge shows that this was covered by the rood screen. Until 1548 the rood staircase led to the top of a carved wooden screen (Rood Loft) which divided the church completely in two, across to an identical staircase in the north wall. 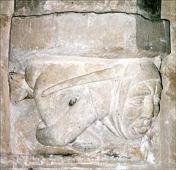 A Mass Dial can be seen by the rood stairs on the south wall. 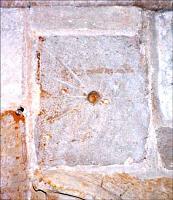 Mass dials (scratch dials) are medieval and found on the south walls of churches, however due to rebuilding they can often be found repositioned on internal church walls, as in this case. They are not meant for recording the hours of the day, but as a marker for church services. A wooden or metal peg called the gnomon, was put in the hole and its shadow marked the times for morning Mass, noon and vespers (evensong) to make sure that both the priest and people were in time for services in the days before clocks and watches.